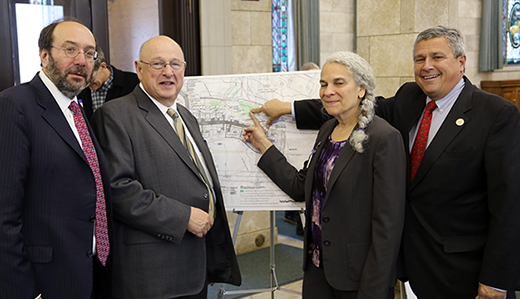 Senator Christopher “Kip” Bateman, the ranking Republican member of the Senate Environment Committee, announced that the committee has taken official action to help protect the Princeton Battlegrounds and surrounding wetlands from irreparable harm. Sen. Bateman first urged the convening of the hearing, providing environmental experts, residents, and historians with the opportunity to deliver testimony on the dire need to halt the Institute for Advanced Study’s plans to build housing on top of wetlands and hallowed ground at the Princeton Battlegrounds. “Today my fellow Senate committee members and I had the opportunity to hear eye-opening testimony, providing clear and indisputable evidence supporting our fight to protect this hallowed ground,” Senator Bateman said. “We simply cannot allow construction crews to bulldoze 238 years of history and irreversibly decimate the surrounding wetlands. “I am pleased to report that my Senate colleagues and I have signed an official letter to the DEP stating that based on the research presented by those who testified today, we support the Princeton Battlefield Society’s efforts to secure a legal stay to halt construction, as we believe that this action is necessary to protect the historic battlegrounds and surrounding wetlands from irreparable harm,” Senator Bateman added.